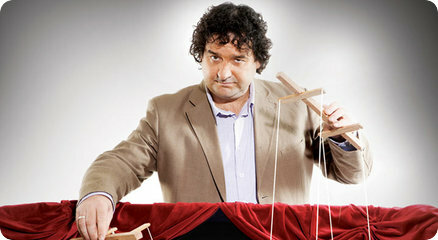 There’s a nice little moment in this week’s episode of Movie Extra’s rather excellent new comedy, The Jesters, in which the Mick Molloy character, Dave Davies (a thinly disguised Doug Mulray) is informed by his agent, Di Sunnington (the marvelously deadpan Deborah Kennedy), that Jane Campion wants him to play the part of the villain in her new movie, Gumtree. Worried it’s an arthouse flick, Dave presses her for a bit more information, only to be told it’s based on a Peter Carey novel. “Have you read it?’ he asks, to which Di replies with haughty disdain, ‘Don’t be stupid, it’s a Peter Carey novel, nobody’s read it”. It’s a cheap line, but it’s a funny one (it doesn’t hurt that every time I hear Deborah Kennedy say “Don’t be stupid,” I’m reminded of her fabulous performance opposite Sam Neill in Death in Brunswick), the only problem is that (a) the book they’re talking about doesn’t sound anything like a Peter Carey novel, and (b) from the plot description and the title it’s clearly meant to be Murray Bail’s Eucalyptus, which was famously about twelve hours away from being made into a movie starring Russell Crowe and Our Lady of the Immovable Face, Nicole Kidman, when it came suddenly and spectacularly unravelled a couple of years ago. All of which does, in a way, make the joke even funnier. Because the laugh depends on the assumption no-one reads Peter Carey, and the general risibility of Australian writers and writing, but in fact they’ve had to change the name of the writer the joke is really about because while enough people will have heard of Peter Carey to make the joke work, absolutely nobody’s heard of Murray Bail. (Just btw, here’s a clip from this week’s episode, an “out-take” of Molloy’s Dave Davies doing his nut on set). Deborah Kennedy is an unrecognised genius for her work in Death In Brunswick alone. Sounds like this is another great role for her in which she disassembles ambition and self-delusion in her gleeful style. Surely she deserves her own series? Jesters looks great from what can be seen on the web. Wonder what the Chaser make of it. Hi James. The joke is funny, but your analysis is funnier. And for anyone to say that “no-one” has heard of a writer or read a particular book – or seen a cable TV comedy show – is of course to deflect any feeling of inadequacy or shame for not having done so. Part of the reason for the longevity and health of our cultural cringe, I suspect. A process of deflection which is painfully evident in the response to the Hey Hey blackface skit, I suspect. Step 1 – do something manifestly and egregiously offensive without any satirical purpose. Step 2 – Insist angrily that anyone who finds it offensive lacks a sense of humour. Result – any need to re-examine thinking avoided.